She’s the only girl in her Autism Special Education class. She’s in 4th grade as of this writing. I’ve worked as a substitute teacher’s aide in classes she’s attended since she was in pre-school. I’ve met all her teachers and without exception they have described her as being very smart. I could see that myself from watching her do class assignments. She was more often than not the student who knew the answer to the teacher’s question before anyone else. I thought some years back that she had the potential to be one of the ones who would transfer to general education classes. Well, the transfer isn’t complete at this writing but she is spending some of her school day in general ed. Her teacher is hopeful it will increase to full-time. She is book-smart, but her behavior and social skills needs a bit more work. I empathize with this student as I do others in her class. One doesn’t outgrow Autism. I’m 60 and my social skills could still use some work. Such as I enjoy being a substitute aide but such things as deciphering teacher’s verbal instructions is a constant challenge for me. It is a common Autism trait to be “brutally honest”. This 4th grader definitely has this trait. Or, you could say that tact is not her thing. Maybe she will learn it as she gets older and maybe not. For instance, on one occasion, the other aide and I were sitting at the table with her. She told the aide whom I guessing is in her 40’s, “You are a little old.” Then, she looked at me and said, “You are…”. I interrupted her with wave of hand. I knew what was coming and stopped her in mid-drift from saying “very” old. That’s the one time I caught her. In other words, most times I didn’t dodge her brutally honest bullet. Kids, you gotta love ’em, whether they are growing on the Spectrum or not. When the usual family members come for Sunday dinner, I hide out in my room playing with one of my adult toys like a computer, laptop, or one of my robots to name a few. My grandniece and nephew leave the dinner table first and dart to MY room. I could say it is because they want so badly to see me, but truth is, it’s the objects of my autistic passions (electronic gadgetry) that draw them to their Aunt’s room. Oh, and they adore me too. On a Sunday, my 9-year-old grandniece had a curious look on her face when she looked at what was residing in my closet. “You have a pantry in there?” Well, that’s true. A microwave and small oven with food items above on the shelf would qualify as being such. Isn’t that what a kitchen is for? The kitchen is my Mom’s territory. I eat in the bedroom and my meals are completely and totally a solo affair. It’s just easier to cook my meals in my own room. What really had my grandniece curious than just a food pantry in a bedroom closet was why I just had boxes of cereal and oodles of sodas. I told her I had Autism. She didn’t know what that was and I figured as much. I told her when she learned what the word meant, then she’d understand why her Aunt Sashi was that way she was. This is another bright side to my Autism. If I was a neurotypical, I dare say it would not be my room that my grandniece and nephew darted off to on Sunday afternoons. What happens if you keep an Aspie from following his special interests? WARNING – be prepared for WWIII! If someone tried to keep me from my special interest, for instance, my electric scooters, it would be, more or less, the equivalent of taking a pacifier from an infant, a favorite toy from a child, a cell phone from an outgoing teenager, and the remote control from a couch potato. There would be trouble with a capital “T” if my scooters were off-limits. The products of my electronic gadget obsession fill my bedroom. If I wasn’t allowed to shop at Best Buy to add to my collection, my moaning could be heard in the hinterlands. It is my special interests that are the bright side of living on the Autism Spectrum (AS). I call it compensation for AS’s dark side. If there was a bottle of pills that would take AS away, I would not take them if I had to give up my compensation. I’d give my bottle to those who have AS who are unable to live independently and take care of themselves. There is an exception. If one is pursuing a special interest and it is a threat to themselves or others, then intervention is a must! For example, I gradually increased my exercising from 6000 to 30,000 steps. This occurred after I bought a Samsung Gear watch that counted my steps. Walking became another obsession and I went overboard. How much? My doctor told me to reduce my exercise because I was losing too much weight. I agreed to rack it down to 8 to 10,000. Most days I stick to that. Most days, that is. The attached picture was my once-beautiful car I had bought only six months earlier than the date this picture was taken. As President Trump often adds to the end of his tweets, “It’s sad”! This incident is one example, among many, of how I, living on the Spectrum, handles an anxiety hair-raising emergency of my own making. This happened while I was dogsitting for my brother and sister-in-law. They moved to their retirement home which is located in a remote area out in the country. It may not be remote to them, but it is to me who has resided in suburbia all my life. Now I drove all the way from the big city on a major freeway, a major expressway, and an interstate highway, for three and half hours without a hitch. The same driving back. But my driving score dropped a few notches while attempting to cross my brother and sister-in-law’s backyard. I stumbled with my steering wheel and one of my car’s front shoes landed over the rocks. I turned over some of the rocks that encircled around a patch of dirt. It used to hold a garden until my sister-in-law gave up since not much grew and what did died. Did I immediately call for help? I dare say all those people I know, family and friend and acquaintance, would have been on their phone immediately calling their closest kin or neighbor or anyone who might come to their rescue. Not me! I don’t ask for help until it is a LAST resort! I didn’t want anybody to know. At least, not until I got my car off the rocks. I racked my brain of what I could do to put my car’s tire back on firm ground. I won’t go into all the things I tried because some of my attempts would be downright embarrassing. Finally, I called my brother since I couldn’t think of anything else and I was truly exhausted. I was resigned that I couldn’t get myself out of this one. My brother suggested a few more things that didn’t work. I asked him if he and my sister-in-law had any friends since they have many more of them than I do. Compared to them, I live in solitary confinement. HA! He called his pastor who promised to come over the next morning. After calling my brother, I called my Mom and told her my stuck over the rocks predicament. She hollered, “WHAT?? ?” I don’t get into ordinary jams. I often feel like my “oops!” episodes resemble “I Love Lucy” episodes. Unknown to me, she immediately called her baby brother, my Uncle, who lived about an hour away from my brother. He’s more like a big brother to me since he and I are 5 years apart. When he got out of his car, he could NOT contain his laughter while my Aunt did, at least, in my presence. HA! As my Uncle was coming up with a “free-Pree” (Prius) plan, he asked me where my brother’s septic tank was. He didn’t want to run over it. I answered truthfully and loudly, “How in the world would I know?” I wouldn’t know a septic tank if it bit me. I wasn’t raised where cows roam and hens lay eggs. It took a backhoe, my Uncle’s big pick-up truck, my Aunt assisting with signal maneuvers, two long silver planks, and a chain to free Pree from off the rocks. My Uncle did need my assistance which considerably raised my anxiety because he was giving me verbal instructions. This is not something I do well. He said things like “Steer to the right just a tad”, well, just what is a tad? I just watched his facial expression knowing that would show if I steered his version of a tad or went over or under one. Pree’s shoe that took the hit had a bulge in it. I’m glad my Uncle pointed it out because I would have been clueless about it. I know a lot about electric gadgets, such as computers, because that’s my passion. Auto mechanics is not! If he hadn’t told me the tire was sour, I probably would have needed rescuing again on the side of a road with a blown-out tire. I got it replaced easy enough at a tire place that knows my Uncle really well. All’s well that ends well. My Uncle told me afterwards he had taken the damaging pictures and already e-mailed them to my Mom. I wasn’t surprised he did that since one of his joys in life is to tease the person who made him an Uncle for the first time. At least, my Mom only showed them to my other brother. My Uncle doesn’t do Facebook or Instagram and so I didn’t have to worry about these photos going out to the hinterlands. I had taken pictures and texted them to my brother since he needed to see what was going on at the time. Although my brother does do social media, he promised not to post them for all to see. After all, a dog sitter for a home way out in the middle of nowhere is hard to come by. If I could take a single snapshot of myself as a child, it would be of me as a little girl looking out the window watching the children play. A child wishing to join in, but too afraid to step outside and ask “can I play?” Maybe if she had asked, they would have let her join in the circle. But repeatedly being a victim of bullying, she didn’t dare risk rejection. She maintained her distance on the sidelines where she felt safe. She compensated the loneliness with retreating into a world of make-believe where she could be anybody she wanted to be. She made up a cast of characters who let her join their circle. In this world, she got to take part and play the starring role. The little girl knew it was a world of her own imagination. And when she invariably got caught acting strange, pacing back and forth, talking to herself, she’d bear the brunt of the heckling. No matter the fingerpointing, she’d retreat to that imaginary world where she was somebody. I am on the autism spectrum and was only self-diagnosed two years ago at the age of 58. My diagnosis was a gift I shall treasure for the rest of my days. I know now what’s behind how I think, feel, and act. Before the diagnosis, it was like walking in pitch black darkness. The diagnosis was the light bulb. It was largely through working as a substitute teaching assistant that I came to the realization of being autistic. Sometimes I would cross paths with a child who reminded me of the little girl looking out the window. One of those times occurred in an elementary school gym while subbing for a P.E. aide. I was watching the children play in stations, each section being a different game. I noticed a third-grade boy who was standing next to me. I asked him why wasn’t he at one of the stations and he shrugged his shoulders. I asked him, “How about basketball or tether ball, or jump rope, or hula-hoop?” He nodded “no” at all my suggestions. I asked him what he liked to do. He said, “EAT!” I could not keep a straight face. This youngster was tugging at my heart strings. I knew what it was to just watch the other kids play. Instead of pushing him to shoot baskets or jump rope, I asked him if he’d like to take a walk with me. He agreed to that. As we went for our walk around the other kids playing, I asked him questions such as what he was wishing for Christmas. He said, “Food!” This boy had more “food” on his brain than inside his tummy. I asked him what his favorite food was and he said “hamburger” and what hamburger place he liked best and he said “Mom’s”. I assumed he meant Mom’s homemade hamburgers were better than at any restaurant. He pulled out his Mom’s business card with a beaming smile on his face. He was so PROUD of his Mom and it seemed to be of such comfort to him to have the card with her phone number in case he needed to call her. He let me see the card and it was a hamburger restaurant. That explained why his Mom’s hamburgers were the best and his favorite food. He told me he had one sibling, an 18 year old sister, who works with Mom at the restaurant. Since there’s a big difference in ages, perhaps he’s not used to playing with kids his own age. He feels more comfortable with adults than other kids and I was that way when I was his age. Now I prefer hanging out with children more than I do adults. I believe the Lord has blessed me with both my diagnosis and a job that helps me cope with that diagnosis. It was no burden at all to let that child know that he wasn’t invisible to me. I gave him a little bit of time and attention that I wished someone had given me when I was that little girl looking out the window. The past can’t be changed or relived. But my job gives me numerous opportunities to help young ones who struggle with what I struggled with and still do. A question was asked on a website: Is it possible for someone with Asperger’s to replace an obsession with another one? I took a shot at the answer since I have Asperger Syndrome (AS) and I know first hand about having obsessions. Some of mine have come and gone, but a few remain! According to the DSM-IV diagnostic criteria for AS, having an “encompassing preoccupation with one or more stereotyped and restricted patterns of interest that is abnormal either in intensity or focus” is a core symptom of AS. That’s a mouthful! In plain English, this criteria is having unusually strong interests/obsessions. Personally, they can sometimes be overwhelming, annoying, and fascinating. I remember on my job as a substitute teacher’s aide working with a student with AS who was obsessed with monsters. During choice play time, he would bypass the games and I-pads for the crayons and paper to draw pictures of his favorite movie monsters. If there was a movie coming out featuring a monster, along with a superhero, he would tell me all about it. I’d listen knowing my attention was important to him, but I admit I didn’t follow his every word. Many people have special interests. That’s nothing unusual about someone who is not on the spectrum having an obsession. What makes it a “special interest” in the autism criteria is the focus and intensity. When it affects every aspect of one’s life or is sought after with strong intensity to the exclusion of everything else, it is considered a “special interest”. An obsession I long ago gave up but had when I was growing up was soap operas. I spent most of my winter, spring, and summer school breaks in soap opera land consuming hours of soap on my couch potato. Overall I think most of us view them as a positive thing. An obsession I’ve had for decades and still have is with electronic gadgets, such as computers, tablets, voice-activated assistants, smartphones/watches, and virtual reality glasses. Shopping for and getting absorbed in my gadgets recharges my batteries. If I feel one of those awful meltdowns is coming on, sometimes spending quality time with one or more of my gadgets will help me avert one. Sometimes, that is. 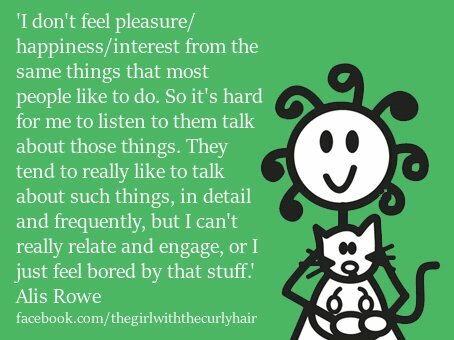 Not all Autistic people have special interests but I think many do. Some people have one special interest while others have multiple. Some people have the same special interest(s) throughout their entire life while some people’s change over time. While most special interests are “harmless,” if an interest involves behavior that is illegal, taboo or a threat to your or someone else’s health or well-being, it may be necessary to seek help in redirecting one’s attention to a safer alternative. I have to curve one down for the sake of my health. My obsession with exercise began when I added to my gadget collection a Samsung Gear smartwatch that counts my steps among other things. Once I got into the routine of counting every step I take, I overdid it! Only by 30,000 steps per day. I take my doctor’s word for it that I’m the only patient in his many years of practice that he had to tell a patient to “cut down on the exercise”. This counting-my-steps obsession is gone. I’m down to 10,000. Just like everybody else, I have “firsts” in my past. A first time to walk which I don’t remember and my Mom doesn’t either. A first time to ride a bike and I’m thankful I don’t remember it since I have no doubt it was a painful experience. A first time to drive a car where the cows didn’t bother to take a hike because I was going slower than a nun driving with two rear flat tires. There was a first time of having an inkling that I was on the Autism Spectrum (AS). That was a little over two years ago. Since then, my memories of firsts have AS playing a part in them. One that comes to mind was my first time to taste wine. One of the things that was different with most of my peers was not having had as much as a sip of alcohol. One exception was alcohol in medicine but I didn’t count that. When I was sick as a child with a horrible cough, the doctor prescribed whiskey. I’ll just say he had a hard time getting my father who was a church deacon to to go an establishment that sold alcohol. Back then, my hometown was “dry” meaning you didn’t find booze at the grocery store or anywhere else within the city limits. My parents were hoping my cough would get better without it but my cough was too stubborn. So a lot of parental influence played a part as to why it wasn’t until my 40’s before I gave wine a taste. My first taste was at a Christmas workparty. My friend/wine mentor advised me to take the white wine for a starter instead of the red wine or the beer. At first sip, oh, my goodness! It tasted like I imagined my car’s oil would taste. Ugh!!! My first thought was, “What in the world can my fellow man see in this horrible tasting stuff?” This was another upteenth time I felt out of step with mankind. I couldn’t imagine people liking the stuff and even using it to celebrate with. I told my friend, “I guess it kind’a grows on you like when I first tried coffee.” She nodded yes. I suspect she was working hard to hold back her laughter. Later on at another work party I tried red wine but had the same results. I did discover liqueors at another Christmas party years later and it tasted much better. However, I don’t crave liqueur. I can take it or leave it. Mostly the latter since the price of a bottle is more than I like the drink. I’m not tempted to order a drink when surrounded by others that do. 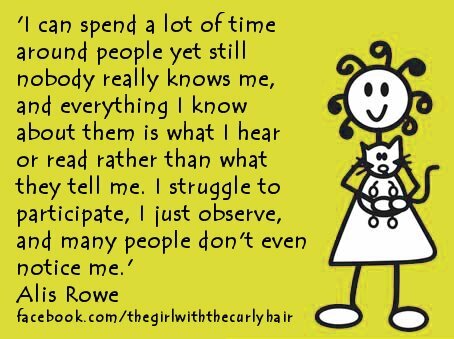 It is my experience living on the Spectrum that I don’t keep up in step with my peers anyway. Now if I’m the only one drinking a non-alcoholic beverage in a room or table full of folks, I stand out like a sore thumb. That still isn’t a comfy feeling. The good thing is I am seldom invited to parties since I’m notorious for giving excuses to get out of them. 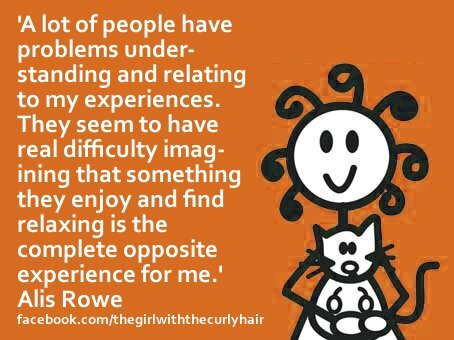 Does Someone with Asperger’s Relate to Children? I was among a few who answered this question posed by someone in a question/answer website. I came across in my research on Asperger’s Syndrome a chart that listed female Asperger’s Syndrome Traits”. One of the items on the list was “is youthful for her age in looks, dress, behavior, and tastes.” I can claim that trait hands down! It explains why I have a herd of electric toys. My toy store is the neighborhood electronics store and my on-line retailer Amazon. I am in the process of trying to keep my balance on a pair of Razor wheel heels. It is like roller skates but just two wheels on my heels. That wouldn’t be strange for a 10-year-old but I’m 50 years older than a 10-year-old. I confess I even sometimes wear them to the store since I don’t want to bother taking them off. When I left Washington D.C. where I worked for the government and went to work subbing as an aide for my hometown school district, I wondered how I’d get along with the kids. It has turned out I am better at it than I would have thought. As I grow older physically, I am growing younger on the Spectrum. When family comes over for Sunday dinner at my Mom’s house, I show up because I live with my Mom. While they eat, I am in my bedroom interacting with my computer. My grandnephew leaves the table first and heads straight to my room. He likes my toys too! His sister isn’t far behind him. My grand niece and nephew, my playmates, can back me up on my acting young for my age. I have a special bond with them that I believe I wouldn’t have if I were neurotypical. There are advantages of having Asperger’s! On my job, I recall escorting an autistic student to gym class. I was glad when a couple of other kids wanted to play with him. One of them got a basketball knowing it was a favorite of my student’s. It was mine too! The other kids let me play too. At the end of class, one of the kids came up to me and said, “You are a lot of fun!” I told her thanks and waved a big smile. That little girl just gave a high-five to a 60-year-old going on 10. The girl with the curly hair and I have a lot in common. I follow her postings because they provide me comfort. So many of the challenges she has are mine too. The posters above are three of them. It is a mystery to me as to how much I enjoy corresponding with someone but have no desire to socialize with that someone. My closet cousin in age and one I grew up with recently dropped in for a good part of the day. We see each other once or twice a year even though we live less than three hours apart. We luv each other dearly even though we are poles apart in politics. My Mom and brother were also there. Most of the conversation was on topics I had zero interest in. Nothing against him but I was bored stiff! When I learned this wasn’t a pop-in but a long-haul visit waiting for his truck to come out of the repair shop, I retreated to my bedroom and got on my computer which is one of my strong interests. Stronger than expresso coffee. I would pop in and out when I could think of a topic I could bring into the room. Such as I popped in with one of my electronic gadgets I had gotten myself for Christmas and did a show-and-tell for my cousin. My pop-in visit was short since he wasn’t as impressed as the kids in the family. I wasn’t surprised at his lack of enthusiasm since he’s one of the FEW people I know who does not even have a FACEBOOK or TWITTER account. I figure I did good enough with my pop-ins. It wasn’t like I deserted him. I was thoughtful enough to turn on the TV for him. A visit from a cousin I love dearly should be something I would be so excited about. I know it would be hard for him or other family members to understand. I love my cousin but I don’t love socializing. It’s just the way it is living on the Spectrum. Here’s a quote I know all too twell: Those who don’t have Autism can’t possibly understand it; those who do can’t possibly fully explain it. How do people with high-functioning autism repair themselves after a social event? The No. 1 rule I have with getting out of social events is to select from my list of excuses. A good rule of thumb is not to overuse any of those on my list. I echo that quote. I have oodles of fun by myself. Since I don’t live alone now, I am not lacking in human interaction as I was when I was living by myself. I confess when I have the house to myself, it is like being on a vacation without being on one. Or, if I housesit when I have an entire house to myself, I am in luxury! It has nothing to do with those around me that I prefer my own company. It’s just the way it is with my ASD. Parties are hard for me to have a good time at, but not impossible. At a social event, the only coping skill I have is eyeing a party outsider too and striking up a conversation. It has worked but it isn’t full-proof. It won’t work if the one sitting alone does not cooperate. If there is no one sitting in the corner but me, it’s going to be a long night. I can’t recall feeling sad when the first party guest left. That’s usually the best part of the evening. After the social event, I cope by being with only me, myself, and I! I go for a walk in the park if there’s daylight left. If not, I find something I enjoy doing to keep me busy such as a word puzzle, catching up on my e-mails, or writing a blog. I have some memories of having honest-to-goodness fun with others. It’s just I don’t have as many of those memories as I have of “me and my shadow”.